"Phar" redirects here. For archive file format, see PHAR (file format). For the film about the racehorse, see Phar Lap (film). For the software company, see Phar Lap (company). Phar Lap with jockey Jim Pike at Flemington Racecourse c. 1930. Phar Lap (4 October 1926 – 5 April 1932) was a champion Thoroughbred racehorse whose achievements captured the Australian public's imagination during the early years of the Great Depression. Foaled in New Zealand, he was trained and raced in Australia by Harry Telford. Phar Lap dominated Australian racing during a distinguished career, winning a Melbourne Cup, two Cox Plates, an AJC Derby, and 19 other weight for age races. He then won the Agua Caliente Handicap in Tijuana, Mexico, in track-record time in his final race. After a sudden and mysterious illness, Phar Lap died in 1932 in Atherton, California. At the time, he was the third highest stakes-winner in the world. His mounted hide is displayed at the Melbourne Museum, his skeleton at Museum of New Zealand Te Papa Tongarewa and his heart is currently on display at the National Museum of Australia, Canberra. The name Phar Lap derives from the common Zhuang and Thai word for lightning: ฟ้าแลบ [fáː lɛ̂p], literally 'sky flash'. Phar Lap was called the "Wonder Horse", "Red Terror", "Bobby" and "Big Red" (the latter nickname was also given to two of the greatest United States racehorses, Man o' War and Secretariat). He was sometimes referred to as "Australia's wonder horse". According to the Museum of Victoria, Aubrey Ping, a medical student at the University of Sydney, suggested "farlap" as the horse's name. Ping knew the word from his father, a Zhuang-speaking Chinese immigrant. Telford liked the name, but changed the F to PH to create a seven letter word, which was split in two in keeping with the dominant naming pattern of Melbourne Cup winners. A chestnut gelding, Phar Lap was foaled on 4 October 1926 in Seadown near Timaru in the South Island of New Zealand. He was sired by Night Raid from Entreaty by Winkie. He was by the same sire as the Melbourne Cup winner Nightmarch. Phar Lap was a brother to seven other horses, Fortune's Wheel, Nea Lap (won 5 races), Nightguard, All Clear, Friday Night, Te Uira and Raphis, none of which won a principal (stakes) race. He was a half-brother to another four horses, only two of which were able to win any races at all. Sydney trainer Harry Telford persuaded American businessman David J. Davis to buy the colt at auction, based on his pedigree. Telford's brother Hugh, who lived in New Zealand, was asked to bid up to 190 guineas at the 1928 Trentham Yearling Sales. When the horse was obtained for a mere 160 guineas, he thought it was a great bargain until the colt arrived in Australia. The horse was gangly, his face was covered with warts, and he had an awkward gait. Davis was furious when he saw the colt as well, and refused to pay to train the horse. Telford had not been particularly successful as a trainer, and Davis was one of his few remaining owners. To placate Davis, he agreed to train the horse for nothing, in exchange for a two-thirds share of any winnings. Telford leased the horse for three years and was eventually sold joint ownership by Davis. Although standing a winning racehorse at stud could be quite lucrative, Telford gelded Phar Lap anyway, hoping the colt would concentrate on racing. Phar Lap finished last in the first race and did not place in his next three races. He won his first race on 27 April 1929, the Maiden Juvenile Handicap at Rosehill, ridden by Jack Baker of Armidale, a 17-year-old apprentice. He didn't race for several months but was then entered in a series of races, in which he moved up in class. Phar Lap took second in the Chelmsford Stakes at Randwick on 14 September 1929 and the racing community started treating him with respect. He won the Rosehill Guineas by three lengths on 21 September 1929, ridden by James L. Munro. As his achievements grew, there were some who tried to halt his progress. Criminals tried to shoot Phar Lap on the morning of Saturday 1 November 1930 after he had finished track work. They missed, and later that day he won the Melbourne Stakes, and three days later the Melbourne Cup as odds-on favourite at 8 to 11. 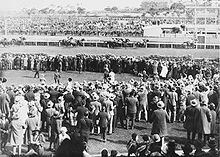 Phar Lap winning the Melbourne Cup Race from Second Wind and Shadow King on 4 November 1930. In the four years of his racing career, Phar Lap won 37 of 51 races he entered, including the Melbourne Cup, being ridden by Jim Pike, in 1930 with 9 st 12 lb (138 pounds (63 kg)). In that year and 1931, he won 14 races in a row. From his win as a three-year-old in the VRC St. Leger Stakes until his final race in Mexico, Phar Lap won 32 of 35 races. In the three races that he did not win, he ran second on two occasions, beaten by a short head and a neck, and in the 1931 Melbourne Cup he finished eighth when carrying 10 st 10 lb (150 pounds (68 kg)). Phar Lap at the time was owned by American businessman David J. Davis and leased to Telford. After their three-year lease agreement ended, Telford had enough money to become joint owner of the horse. Davis then had Phar Lap shipped to North America to race. Telford did not agree with this decision and refused to go, so Davis, who along with his wife traveled to Mexico with him, brought Phar Lap's strapper Tommy Woodcock as his new trainer. Phar Lap was shipped by boat to Agua Caliente Racetrack near Tijuana, Mexico, to compete in the Agua Caliente Handicap, which was offering the largest prize money ever offered in North America racing. Phar Lap won in track-record time while carrying 129 pounds (58.5 kg). The horse was ridden by Australian jockey Billy Elliot for his seventh win from seven rides. From there, the horse was sent to a private ranch near Menlo Park, California, while his owner negotiated with racetrack officials for special race appearances. Early on 5 April 1932, the horse's strapper for the North American visit, Tommy Woodcock, found him in severe pain and with a high temperature. Within a few hours, Phar Lap haemorrhaged to death. An autopsy revealed that the horse's stomach and intestines were inflamed, leading many to believe the horse had been deliberately poisoned. There have been alternative theories, including accidental poisoning from lead insecticide and a stomach condition. It was not until the 1980s that the infection could be formally identified. In 2000, equine specialists studying the two necropsies concluded that Phar Lap probably died of duodenitis-proximal jejunitis, an acute bacterial gastroenteritis. 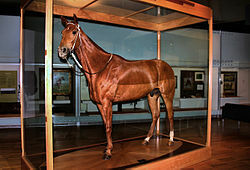 Phar Lap's skin was preserved by Louis Paul Jonas and is now exhibited as a taxidermy mount by Melbourne Museum. In 2006, Australian Synchrotron Research scientists said it was almost certain Phar Lap was poisoned with a large single dose of arsenic in the hours before he died, perhaps supporting the theory that Phar Lap was killed on the orders of U.S. gangsters, who feared the Melbourne Cup-winning champion would inflict big losses on their illegal bookmakers. No real evidence of involvement by a criminal element exists, however. Sydney veterinarian Percy Sykes believes deliberate poisoning did not cause the death. He said "In those days, arsenic was quite a common tonic, usually given in the form of a solution (Fowler's Solution)", and suggests this was the cause of the high levels. "It was so common that I'd reckon 90 percent of the horses had arsenic in their system." In December 2007, Phar Lap's mane was tested for multiple doses of arsenic which, if found, would point to accidental poisoning. On 19 June 2008, the Melbourne Museum released the findings of the forensic investigation conducted by Ivan Kempson, University of South Australia, and Dermot Henry, Natural Science Collections at Museum Victoria. Kempson analyzed six hairs from Phar Lap's mane at the Advanced Photon Source at Argonne National Laboratory near Chicago. These high resolution X-rays detect arsenic in hair samples, showing the specific difference "between arsenic, which had entered the hair cells via the blood and arsenic which had infused the hair cells by the taxidermy process when he was stuffed and mounted at the museum". Kempson and Henry discovered that in the 30 to 40 hours before Phar Lap's death, the horse ingested a massive dose of arsenic. "We can't speculate where the arsenic came from, but it was easily accessible at the time", Henry said. In October 2011 the Sydney Morning Herald published an article in which a New Zealand physicist and information from Phar Lap's strapper state that the great horse was never given any tonic with arsenic and that he died of an infection. Said Putt, "Unless we are prepared to say that Tommy Woodcock was a downright liar, which even today, decades after the loveable and respected horseman's death, would ostracise us with the Australian racing public, we must accept him on his word. The ineluctable conclusion we are left with, whether we like it or not, is that Phar Lap's impeccable achievements here and overseas were utterly tonic, stimulant, and drug-free." Contradicting this is the tonic book of Harry Telford, Phar Lap's owner and trainer, on display in Museum Victoria, Melbourne. One recipe for a "general tonic" has a main ingredient of arsenic and has written below it: "A great tonic for all horses". Several theories have been proposed for the large amount of arsenic in Phar Lap's body. Phar Lap's heart at the National Museum of Australia. It was formerly held by the Institute of Anatomy in Canberra. Following his death, Phar Lap's heart was donated to the Institute of Anatomy in Canberra and his skeleton to the New Zealand's National Museum in Wellington. After preparations of the hide by a New York City taxidermist, his stuffed body was placed in the Australia Gallery at Melbourne Museum. The hide and the skeleton were put on exhibition together when Wellington's Te Papa Museum lent the skeleton to the Melbourne Museum in September 2010 as part of celebrations for the 150th running of the 2010 Melbourne Cup. Phar Lap's heart was remarkable for its size, weighing 6.2 kilograms (14 lb), compared with a normal horse's heart at 3.2 kilograms (7.1 lb). Now held at the National Museum of Australia in Canberra, it is the object visitors most often request to see. However, the author and film maker Peter Luck is convinced the heart is a fake. In Luck's 1979 television series This Fabulous Century, the daughter of Walker Neilson, the government veterinarian who performed the first post-mortem on Phar Lap, says her father told her the heart was necessarily cut to pieces during the autopsy, and the heart on display is that of a draughthorse. Several books and films have featured Phar Lap, including the 1983 film Phar Lap, and the song "Phar Lap—Farewell To You". Phar Lap was one of five inaugural inductees into both the Australian Racing Hall of Fame and New Zealand Racing Hall of Fame. In the Blood-Horse magazine ranking of the Top 100 U.S. Thoroughbred champions of the 20th century, Phar Lap was ranked No. 22. The horse is considered to be a national icon in both Australia and New Zealand. In 1978 he was honoured on a postage stamp issued by Australia Post and features in the Australian citizenship test. A $500,000 life-sized bronze memorial to Phar Lap was unveiled on 25 November 2009 near his birthplace at Timaru. Phar Lap has been honoured with a life-sized bronze statue at Flemington Racecourse in Melbourne. "Phar Lap Raceway" in Washdyke, New Zealand (where he was foaled) was named in his honor, with a life-size statue at the entrance. ^ a b "Phar Lap". The Australian Racing Museum. Retrieved 24 April 2009. ^ "Pedigree". Pedigreequery.com. 30 April 2007. Retrieved 6 May 2010. ^ "Phar Lap, Champion Race Horse (1926-1932)". Museum Victoria. Retrieved 13 January 2019. ^ a b "The Horse". Museum Victoria. Retrieved 24 April 2009. ^ "Phar Lap". Thoroughbred Heritage. Retrieved 24 April 2009. ^ a b "Story of Phar Lap". pharlap.org.nz. Archived from the original on 29 August 2009. Retrieved 24 April 2009. ^ "Phar Lap, Agua Caliente". Museum of Victoria. p. 1. Retrieved 24 April 2009. ^ "Lightning". Phar Lap: Australia's wonder horse. Museum Victoria. Retrieved 24 April 2009. ^ a b "The Phar Lap Story". Retrieved 20 April 2009. ^ "Phar Lap called Bobby round the stables". Mountainhomeplace.com. Retrieved 6 May 2010. ^ "Phar Lap". Museum Victoria. Retrieved 24 April 2009. ^ Museum Victoria. "Background to the naming of Phar Lap – Museum of Victoria". Museumvictoria.com.au. Retrieved 6 May 2010. ^ a b c "Phar Lap (1926–1932)". Te Papa. p. 2. Retrieved 24 April 2009. ^ Phil Purser. "Jack Baker rode himself into Australian racing history". Retrieved 30 July 2007. ^ "Shot fired at Phar Lap". Trove.nla.gov.au. 3 November 1930. Retrieved 6 May 2010. ^ Museum of New Zealand Te Papa Tongarewar. 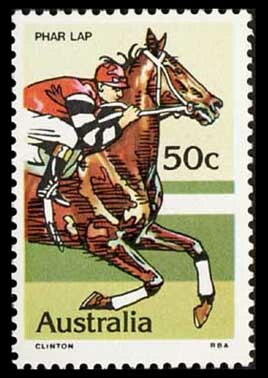 "Collections:Phar Lap". Retrieved 20 April 2009. ^ "Phar Lap wins the cup". Trove.nla.gov.au. 5 November 1930. Retrieved 6 May 2010. ^ Moriarty, Richard (28 October 2006). "Blame 'The Brazilian'". News.com.au. Retrieved 6 May 2010. ^ Geoff Armstrong and Peter Thompson (2000). Melbourne Cup 1930. Allen & Unwin. ISBN 978-1-74114-750-6. ^ "Phar Lap poisoned, scientists say". ABC News Online. 23 October 2006. ^ "PHAR LAP WAS POISONED". The Courier-Mail. Brisbane: National Library of Australia. 19 September 1936. p. 11. Retrieved 7 February 2011. ^ "Catalyst (2008 report on arsenic death of Phar Lap)". ABC News Online. 19 June 2008. ^ "Phar Lap arsenic claims premature: expert". ABC News Online. 23 October 2006. ^ "Sydney Morning Herald: It's official, Phar Lap was poisoned". Smh.com.au. 19 June 2008. Retrieved 6 May 2010. ^ Kempson I, Henry D (2010). "Synchrotron Radiation Reveals Arsenic Poisoning and Metabolism in Hair: The Case of Phar Lap". Angew. Chem. Int. Ed. doi:10.1002/anie.200906594. ^ "Yahoo! Sports: Phar Lap died of arsenic poisoning". Sports.yahoo.com. Retrieved 6 May 2010. ^ "Phar Lap poisoning theory down the drain". The Sydney Morning Herald. ^ "Sportsmen and women (... and a horse and a boat)". Australian Government. Australian High Commission – New Zealand. Retrieved 24 April 2009. ^ a b "Phar Lap's return to Timaru". The Phar Lap Trust. Retrieved 25 April 2009. ^ "Minister promotes Spring Racing Carnival in New Zealand". From the Minister for Racing, Minister for tourism. Retrieved 27 April 2009. ^ "Just how Australian are you?". Democrats.org.au. 5 October 2007. Retrieved 6 May 2010. ^ "Phar Lap sculpture unveiled in Timaru". Radio New Zealand. Retrieved 6 February 2019. Wikimedia Commons has media related to Phar Lap. This page was last edited on 7 April 2019, at 20:56 (UTC).